For sale is a limited edition copy of the Skybox Hologram Batman Skydisc! This is number 002853 of 10,000. UP FOR SALE IS A VERY RARE OVERSIZED "BATMAN SAGA OF THE DARK KNIGHT" BATMAN SKYDISC 3D HOLOGRAM PROMO CD. THE CD IS NUMBERED 695 OF 10,000. A LOW PRODUCTION NUMBER! IT IS FROM THE 1994 SKYBOX COLLECTION. 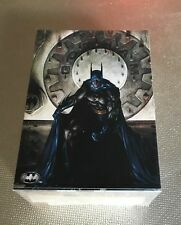 BATMAN: SAGA OF THE DARK KNIGHT – COMPLETE 100-Card Set Skybox-1994 W/PROMO CBC1 in NR-MINT condition from my personal well maintained and well preserved collection, so bid with confidence. Any questions, please ask, and thanks for looking! This 1994 Skybox Batman card set covers all the major periods from the Dark. both comic talent and of the Batman's entire history. Skybox knocked. Knight's history from Year One through the Knightfall/KnightQuest eras. Box is open but 35 packs are new unopened. The picture being used is of THE actual item you will receive. This set is missing cards # 95, 96 and 100 with a couple duplicate cards. All are in very nice condition. Released in 1994 by Skybox. PORTRAITS OF THE BATMAN CARD B3 "1994 SKYBOX BATMAN SAGA OF THE DARK KNIGHT"
AS IT IS (IN LIKE NEW CONDITION) , ONE (1) PORTRAITS OF THE BATMAN B3 "1994 SKYBOX BATMAN SAGA OF THE DARK KNIGHT". Trading Card is Like New and the Snap Case. Product Weight With Case & Trading Card: 1.0 Ounce. You will receive: 1 1994 Batman Saga of the Dark Knight Skydisc Promotional CD in its original factory sealed package(Very Rare) 1 1990s Avengers Hologram Poster in a Brand New Frame(Very Rare) 1 1990s Spider-Man and Venom Hologram Poster in a Brand New Frame(Very Rare) You get all as you see so no refunds Message with any questions, I am happy to help! Expect a response usually within the hour Thanks for viewing! Here is a complete set 1-100 “SagaOf The Batman” Trading Cards plus one wrapper & Portrait of Batman #B4. All are in perfect condition& were kept in Plastic Protective Loose Leaf Sheets which are included. ”SKYBOX INTERNATIONAL PRESENTS THE FIRST AUTHORIZED COMIC BATMAN CARD COLLECTION IN OVER 25 YEARS! THE PREMIUM 100 – CARD SERIES WILL FOLLOW BATMAN’S REINCARNATION AS THE DARK KNIGHT IN 1986 THROUGH KNIGHTQUEST IN 1994, ILLUSTRATED WITH ALL – ORIGINAL ARTWORK. Batman: Saga of the Dark Knight Skydiscs SD1 Card Framed Condition is New. Shipped with USPS Priority Mail. Both the front and reverse of the card are shown in the scans. It is not a pre-printed signature on the card. No third party is involved. We apologize for any inconvenience and appreciate your understanding. One could make the case that it’s the best bunch of Batman-centric cards anyone has ever slapped together, and Lord knows there have been a lot of them. (obsessive you might say) care since their original release. 10 sets of 1993 DC Bloodlines (Skybox). Each sets contains 81 cards for a total of 810 cards. 2 sets of 1994 Batman: Saga of the Dark Knight (Skybox). Each set contains 100 cards for a total of 200 cards. 1994 Skybox Promo Card - Batman: Saga of the Dark Knight. Included are cards B1, B4, and B5. 1994 Skybox Batman Portraits of Batman Chase Cards B1, B4, & B5. This item has been in my pocession since year of issue. Batman: Saga of the Dark Knight - Complete 100 Card Base Set - 1994, Skybox - DC. Condition is Used. Shipped with USPS First Class Package. 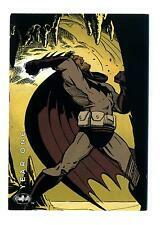 Here is a 1994 Skybox Batman Saga of the Dark Knight Complete 100 Collectors Card Base Set. 53 Poison Ivy & Riddler. 32 Equal Justice. 23 Out of Line. 24 A Death in the Family. 1 Cover Card. 17 The Power of Venom. 1994 Batman-Saga of the Black Knight Complete 100 Card Base Set by Skybox. Cards are in great shape. Original owner. Full base set plus one chase. Bonus hologram batman card. 1994Skybox Batman Saga of the Dark Knight Trading cards. 1994 Skybox DC Batman Saga of the Dark Knight Year One #89 The Vision NM/MT J863 Card is in near mint to mint condition. Card in pictures is card you get. I HAVE TO DO THAT MYSELF AT THE END OF THE ORDER. YOUR ORDER WILL GO OUT AS PROMPTLY AS POSSIBLE. Lot of 100 1994 Batman DC Skybox Collectible Cards. All cards mint or near mint condition. Missing card #69. Mint set.